Do you like poetry? IU East has a great upcoming opportunity for you. 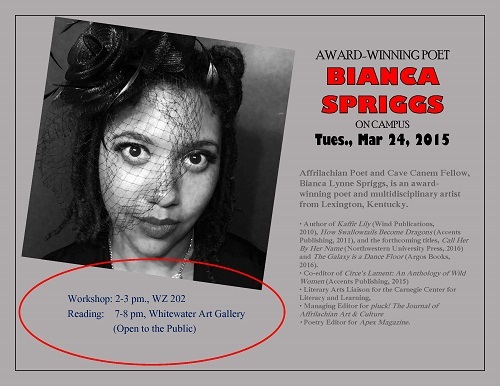 Bianca Lynne Spriggs, an award-winning poet (2013 Al Smith Individual Artist Fellowship in Poetry, several Artist Enrichment and Arts Meets Activism grants from the Kentucky Foundation for Women, and a nominee for the Pushcart Prize) will be coming to campus to read her work on Tuesday, March 24th. The event will be in the Whitewater Hall art gallery from 7-8 p.m., and is open to the public if you want to bring friends or family. She will also lead a workshop for students earlier in the day, from 2-3 p.m. in Whitewater Hall 202. Spriggs is an Affrilachian Poet and Cave Canem Fellow, and was named as one of the Top 30 Performance Poets in the country by The Root. She also created The SwallowTale Project: Creative Writing for Incarcerated Women in partnership with the Kentucky Domestic Violence Association, and is the creator and Artistic Director of the Wild Women of Poetry Slam featured annually at the Kentucky Women Writers Conference. Her writings include Kaffir Lily (Wind Publications, 2010), How Swallowtails Become Dragons (Accents Publishing, 2011), and the forthcoming titles, Call Her By Her Name (Northwestern University Press, 2016), The Galaxy is a Dance Floor (Argos Books, 2016), and Circe’s Lament: An Anthology of Wild Women (Accents Publishing, 2015). She serves as the Literary Arts Liaison for the Carnegie Center for Literacy and Learning where she curates the Red Door Writers Blog, as well as the Managing Editor for pluck! The Journal of Affrilachian Art & Culture and Poetry Editor for Apex Magazine. And the library has plenty more to offer the poetry aficionado, in poems, poetry criticism, and poetry guides. Databases like Litfinder and 20th Century American Poetry give access to hundreds of thousands of poems and poem citations, including the works of such seminal authors as Adrienne Rich, Langston Hughes, Ezra Pound, Denise Levertov, and William Carlos Williams. Other databases include American Poetry (1600-1900), which offers more than 40,000 poems from the Colonial era to the beginning of the twentieth century; and databases dedicated to specific types of authors, such as African-American Poetry (1750-1900), Latin American Women Writers, Black Women Writers, English Poetry (600-1900), Scottish Women Poets of the Romantic Period, and Latino Literature: Poetry, Drama, and Fiction add hundreds of thousands more. But we have plenty of books and anthologies, as well. From various books of poetry like Poetry Oracle, No Turning Back: Poems of Freedom 1990-1993, or Modern English War Poetry to essays on poetry like Poetry as Survival by Gregory Orr and Why Poetry Matters by Jay Parini to how-to books like How to Write Poetry by Fred Sedgwick or Poetry Handbook by John Lennard, we can support the recreational, the scholarly, and the professional use of poetry. Need any help finding what you want? Contact us at iueref@iue.edu!